Recently, the St Albans based bloggers were kindly invited to visit Brasserie Blanc, which opened recently in St Albans. Best known for his restaurant The Manoir, Raymond Blanc has created Brasserie Blanc - an eatery which offers relaxed, informal, local dining, and which features delicious, reasonably priced seasonal high quality food. Apart from their brand suppliers, Brasserie Blanc use locally sourced food, from local producers - which is great for local business, and as a consumer, it is great to know that your custom is supporting businesses locally. We were kindly welcomed by the manager and introduced to the set menu - which changes each month and features seasonal food. The set menu runs until 7pm and in St Albans, features two courses for £11.50 and three courses for £13.95 (prices vary between venues). The Vegetarian's had a choice of two starters - Beetroot and Watercress Salad, and Gnocchi with Jervaux Blue Cheese and Celery. Vegetarian main course was Shirred Eggs with sauteed Muscat Pumpkin and Gruyere Cheese, served with a Green Salad. 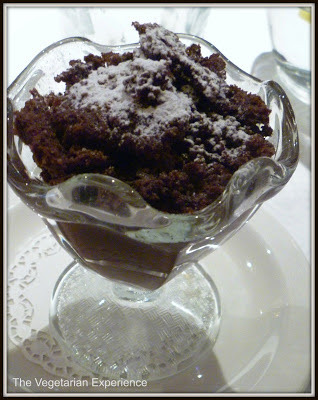 For dessert, I chose Weiss Chocolate Mousse served with Coarse Chocolate Crumble. 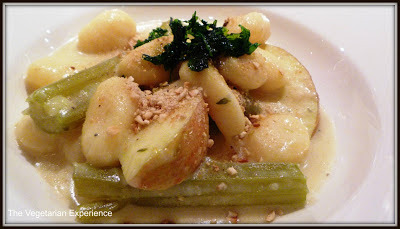 To me, salad is never an acceptable winter starter and so I chose the Gnocchi with Jervaux Blue Cheese and Celery. When it arrived, I noticed it contained raw apple slices, and as they make up quite a bit of the dish, I would have liked to have known about this as this type of raw apple is really not my thing. That said, I really enjoyed the gnocchi and the jervaux cheese, and I loved the celery - I have only ever had raw celery and the taste really changes when you cook it and makes it much more palatable. I really enjoyed this dish and was impressed with the quality of the ingredients used and the presentation. This dish was also really different to anything I have seen on a menu as a vegetarian starter previously, and so it was great to eat something fresh, different and creative. 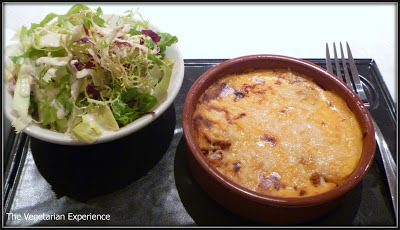 For main course I ordered the only vegetarian choice available - Shirred Eggs with sauteed Muscat Pumpkin and Gruyere Cheese, served with Green Salad. Now, one of my bug bears when I go out is that the vegetarian choice is always served with salad. My fellow bloggers were tucking into their main courses served with lashings of mash potato or potato salad, and all of their main course portions were considerably larger than the vegetarian choice. The main course itself - the Shirred Eggs were really delicious - although a peculiar choice for a main course after the gnocchi, and had I chosen salad for starters, I would have been presented with another salad for main course - so I would have liked the vegetarian starters and main course to complement each other. I can't fault the Shirred Eggs, and I loved the pumpkin which was really well cooked. However, I ended up asking for some bread as the eggs were just to rich to eat on their own, and the green salad was really bland and tasteless, so I would have liked something with the Shirred Eggs that made them a bit more palatable, and didn't make me feel like I had drawn the short straw for being vegetarian - as my dish looked nowhere near as spectacular or substantial as all of the other main course choices. My dessert choice was Weiss Chocolate Mousse served with Coarse Chocolate Crumble. As the "Weiss" would suggest - I was expecting a white chocolate mousse, however, what's not to love about chocolate - however it comes! The Chocolate mousse tasted really... well.. chocolatey and was very smooth, rich and full of flavour. This was a great dessert and a great finish to the meal. I would definitely recommend! 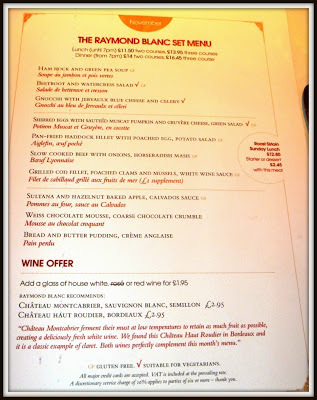 I really enjoyed my visit to Brasserie Blanc St Albans. The restaurant is really well fitted out and was extremely clean - something I am a stickler for. I also liked the ambience which felt really relaxed, informal and unpretentious. I loved the open kitchen style where you can see the chef's cooking - this added to the welcoming environment. The staff were all extremely polite and the service was impeccable - something which is hard to come by these days in many restaurants. Our food was served very promptly and came as it should - with the hot dishes being hot out of the kitchen and looking fresh as though they had been served straight away. 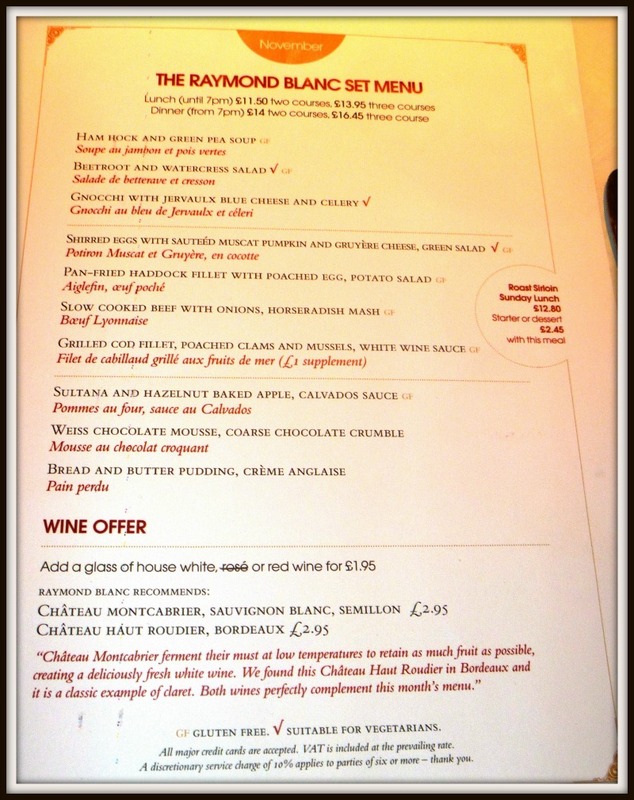 However, I really do think that the vegetarian choice needs to be addressed at Brasserie Blanc St Albans. I was not overly impressed with my main course being served with a bland, tasteless green salad and this month's set menu vegetarian choice is also served with green salad. I also note that the vegetarian main course choice for the Christmas season is Pumpkin Risotto. I would be extremely unhappy if I turned up to eat at the restaurant and paid £26.50 for three courses, only to find that the vegetarian option was Pumpkin Risotto with no other accompaniments..... whilst the meat and fish eaters dined on much more substantial main courses served with an array of accompaniments. To me, risotto is an absolute no no as a vegetarian main course - it's more of an acceptable dish for a pasta/rice course than for a main course. The vegetarians are being severely short changed by being served risotto when the main courses must be costing twice that for the meat and fish eaters but the vegetarians are paying the same price and getting much less of a meal. It's a real shame that the vegetarian main course choices are perhaps overlooked whilst the rest of the menu is so exciting and appetising. I would choose to eat here again, but only if I had checked the menu online first to see whether the vegetarian choice was something I wanted to eat as so far from what I have seen, the vegetarian menu is more miss than hit - which is a shame as I loved every other aspect of the restaurant and I think that it is a great addition to the St Albans restaurant scene. Thanks to Heidi for organising our visit, and to Brasserie Blanc for hosting us.